Description: Are you looking for a funny game to make a cool adventure, guys? Don’t find anymore! Let’s visit Minecraft world. There are a lot of fantastic adventure games for you to select. If you have yet to play Jet Miner, don’t miss the chance to enjoy it. 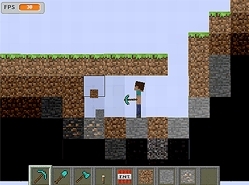 This is one of the best Minecraft games, so it is very interesting. Are your ready for your adventure? Let’s go! In the game, players will come into a wonderful 3D world and find a lot of gems hidden underground. There are many blocks so that the players need to break them to collect the gems. Besides, a map on the game’s screen will support them to show the position of the treasures. Depending on that map, they are able to figure out the gems easily. During the adventure, keep an eye on the timer. There is 90 seconds only for them to complete the journey successfully. Hope for the best to you, guys! Instructions: ASWD keys are to move. The space bar is to fly.